Some time ago, I took the deposition of a professional truck driver and asked him to share with me his definition of a proper space cushion. I thought perhaps he was just unfamiliar with the term, which I had used many times in depositions of other truckers. So I explained that a “space cushion” is just the amount of space around the vehicle a driver needs to navigate safely, starting with a safe following distance. Could he share with me his definition of a safe following distance? The truck driver stared at me blankly. It was as though he was hearing this concept for the first time. Yet, this particular trucker had been operating semi-truck and trailers on highways across the Pacific Northwest for more than 10 years. I’m a lawyer, not a truck driver— but I’ve studied trucking law and regulations for three decades. I am rarely surprised by the things that truckers say in depositions. But it was shocking that a professional truck driver didn’t understand a basic tenet of road safety: safe following distance. 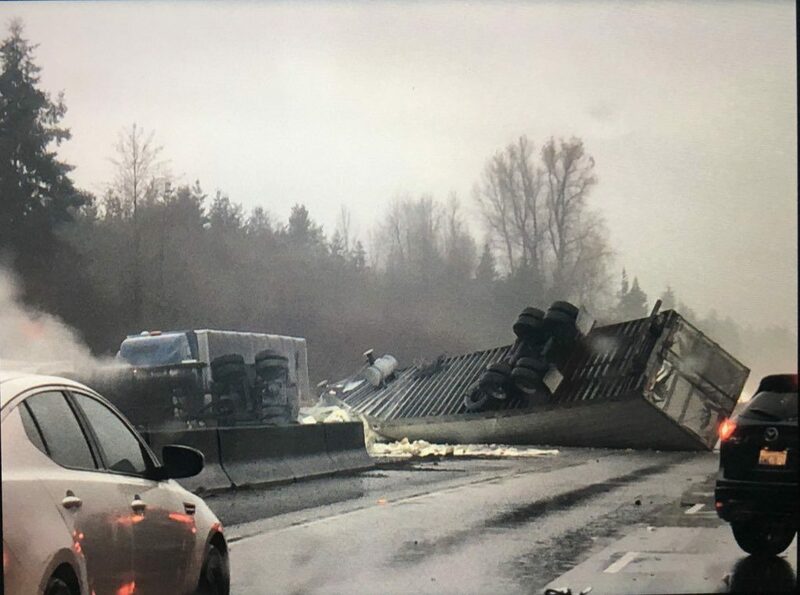 This semi-truck rolled over, spilling a load of powdered milk on I-5. Properly trained semi-truck drivers are taught to allow an appropriate “space cushion” for a situation that may occur, such as happened here. Photo shared by Washington State Patrol troopers via Twitter. What’s a safe following distance? To calculate a safe following distance, you have to know how long it would take the vehicle to stop. Stopping distance is just the amount of time it would take you to physically halt the vehicle. Perception distance is the number of feet the vehicle travels from the time an event occurs until you spot it and recognize the situation, such as a car stopping ahead, or a hazard such as a car spinning out. Reaction distance is the number of feet the vehicle travels from the time you recognize the hazard and get your foot on the brake. Age, experience, and awareness play a big role in reaction time. Braking distance is the number of feet the vehicle travels from the time you apply the brake until you come to a full stop. Braking distance is heavily influenced by weather and road conditions. Unlike a car or pick-up truck, commercial trucks must add air-brake lag distance to the total braking distance. Air-brake lag adds about .5 seconds of additional stopping time. A trucker has to know much time it would take to stop the tractor-trailer, and the distance it will travel before coming to a full stop. That’s the bare minimum. Properly trained professional drivers know how to anticipate potential dangers and hazardous conditions. In addition to the stopping distance, these are the key considerations for determining a safe following distance. The driver: experience, skill and physical condition. While this may all seem a bit complicated, it is an important part of the job for a professional driver. It is up to every motor carrier to make sure that their drivers understand safe following distance. Their lives—and our lives—depend upon it.